Jumping out of closets and scaring frightened kid after kid--it can get tiring after a while. But with a few remedial classes, some good petting, and a little bit of adjustment therapy, you'll no longer have that instinct to frighten children. Or you could skip all of the therapy and coursework and just transform yourself into the friendliest monster around – Sully! From the most decorated scarer ever at Monster’s, Inc. to funny, fuzzy laugh machine, Sully has been a crowd-pleasing favorite monster for many. Heck, you may even have his rookie scare card if you’re a true fan! If you don’t want to go it alone this Halloween, check out our Mike Wazowski costumes so you can have your trusty sidekick around all night. Sully and Mike have been friends since their freshman year of college, so you wouldn’t want to go out for a night on the town without him. Whether you or your kids love the movie (or maybe both of you do! ), this Plus Size Sullivan the Monster Costume will make you the most popular monster around at your next birthday party or Halloween gathering! 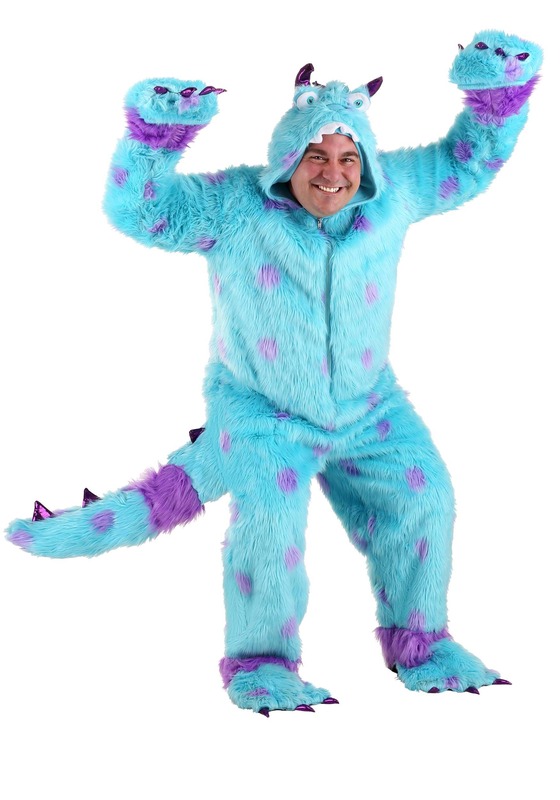 This Sully costume is comfortable wear all night and has a zip-front closure for easy on and off. His signature furry purple polka dots accent the jumpsuit and the paws and footies are attached so you can look like Sully from head to toe! The attached tail and hood complete the look. Who wouldn’t want to give this huge, lovable monster a big hug?